Dealers have been eager for face time with CEO Sergio Marchionne. DETROIT -- Chrysler Group dealers gather in Orlando this week to see the company's new products and to meet someone they have been waiting a long time to hear from: CEO Sergio Marchionne. Owners of about three-quarters of Chrysler's 2,314 dealerships will be there -- record attendance for a product announcement show, a company source said. Chrysler will use the meeting to pump up enthusiasm for its new-product offensive. Executives will take questions from wary dealers still smarting from the company's bruising 2009 trip through bankruptcy, which saw the rejection of 789 dealerships and financial hardship for many survivors. David Kelleher, a member of the Chrysler National Dealer Council, said: "We've got a long way to go. A lot of dealers have been through a lot. This is going to be a necessary step in the process." Dealers will see the company's latest products -- including the redesigned Dodge Durango crossover, which will arrive in dealerships in the fourth quarter. They also will hear from Marchionne, who has not addressed more than small groups of dealers, and from the CEOs of the four brands. Kelleher said Chrysler is taking pains to answer tough questions. The dealer council has collected questions in advance from dealers, and their names will not be attached so dealers needn't fear reprisals, Kelleher said. Executives, led by sales boss Fred Diaz, will answer the questions Tuesday, Sept. 14. Among the issues will be questions about Chrysler's reintroduction of the Fiat brand in North America. Only owners of 600 dealerships, from markets selected by Chrysler, were invited to attend an August Fiat briefing in Detroit. Some dealers feel left out of the opportunity. Dealers are still struggling with the new Dealer Standards program, which rewards them with cash for complying with a long list of company requirements for customer treatment and facilities. Some dealers wonder why it has taken so long for Marchionne to address them. The Chrysler CEO has said he didn't want to talk until he had something of substance to say. 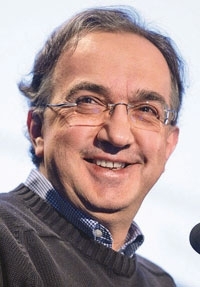 Since the automaker's bankruptcy, Marchionne has led Chrysler's product development team in a whirlwind of activity. The company is introducing refreshed products this year. This will mark the first time the company has held a dealer new-model show since October 2007, when dealers heard from then-CEO Bob Nardelli and co-President Jim Press. Kelleher is enthusiastic about the new Fiat-led management team but said the team will have to earn the trust of dealers who have been let down before. Said Kelleher: "Last time we did this was at a meeting in Las Vegas -- guys named Press and Nardelli, and they came off terrific. Two years later they were selling us down the road. Even if these guys come off terrific, there's still a healing process." Ralph Martinez, owner of two Chrysler dealerships in the Portland, Ore., area, has been selling cars for Chrysler since the 1970s. He said his dealership is just getting back on its feet after Chrysler's bankruptcy. "I think we're all trying to deal with survival mode," Martinez said. "We can only do that for so long. We're looking for something to put us in thriving mode. "We are just starting to see growth. Our margins are better. Volumes have increased by a good 20 to 25 percent." Martinez, who sold Fiats in the 1970s, said he sees something different in the current management team. "There's a whole new energy there. The intensity is phenomenal. You can see the fire in their eyes. "Underpromise and overdeliver, that's their philosophy. From what I'm seeing and hearing and feeling, Chrysler could be the sleeper of the automotive industry."